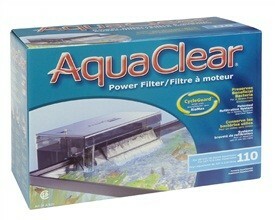 The AquaClear 110 Power Filter features a unique multi-stage filtration system that provides complete mechanical, chemical and biological filtration for superior water quality. The Power Filter has a filtration volume that is up to 7 times larger than comparable filters. It also allows superior contact time with filter media.